Reinhardt’s Tampa Custom Motorcycles Lutz. Bike customization can come in different spurts. An average motorcycle driver will eventually purchase upgraded mirrors and some external accessories like skull stem covers. Once your bike becomes challenged by a faster bike, louder bike or better looking bike; then you are ready to put some serious consideration into customization. Reinhart’s Motorcycles on Dale Mabry should be your first stop for a conversation about customizing your bike. Reinhardt knows Harleys, baggers and custom motorcycles better than most others in Tampa. You can have a ton of questions and we have an ever changing selection of custom bikes for sale. So drive yourself over to Reinhardts Motorcycles. Walk ins always welcome for preferred times call 813-909-2299. 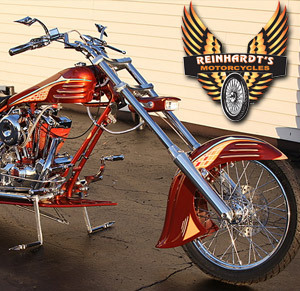 Reinhardt’s Motorcyles is a certified independent Harley repair shop specializing in bike repairs from 2000 and newer. Reinhardt’s opens his doors every day to find new and interestingly requested customizations from all different types of customers. We roll out some of the hottest upgrades in Tampa with a passion for bagger conversions. Looking for that boost of acceleration and power? Reinhardt will have your bike running so fast your whole neighborhood will be jealous. Awesome paint and a new shine is totally possible at Reinhardts. Joining our shop as a customer makes you part of the family at Reinhardt’s Motorcycles. Hope to see you soon! Tampa Custom Harleys at Reinhard’ts Motorcycles! NEW @ REINHARDTS MOTORCYCLES we are a FRANKENSTEIN Trike Dealer and Installer for all Harleys!